The DXF and DWG format is very important for municipalities and provinces for the exchange of geometric data with architects and urban plannners. Some communities and utility companies in Switzerland therefore initiated a project to introduce a powerful and easy to use DXF export function directly in QGIS. The primary goal is being able to export utility and cadastral data. The export function can be reached in the menu "Project" --> "DXF Export". Support for "visibilty presets": these are bookmarks on layer visbiltiy and style combinations. As an example you can set a bookmark on all utility layers, without the cadastral data. In the screenshot below you can see the same data extent - on the left QGIS with the original rendering - on the right the exported DXF file rendered in Autodeskt TrueView. 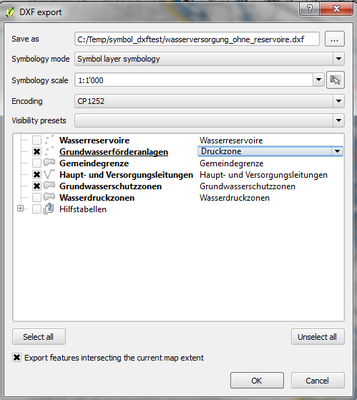 If you want to use all of the above mentioned export features, you have to use QGIS 2.10. There will be a backport of the functionality to version 2.8.3. The DXF export functionality was developed by Jürgen Fischer (Norbit) and Marco Hugentobler (Sourcepole AG). The project was co-financed by SIGE (utility provider in Vevey) and the municipalities of Vevey, Morges and Uster.